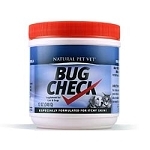 Why do we say our Joint Check for your pets is not just another "joint product"? 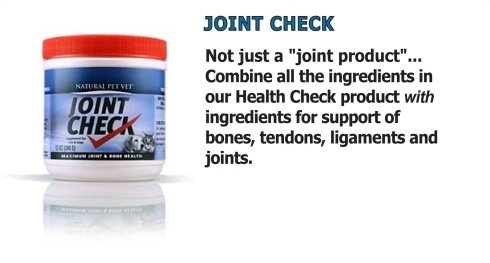 With Joint Check we have synergistically blended the antioxidant and microbial power of our Health Check product with potent amounts of time-trusted natural ingredients to provide the support desired for healthier bones, stronger connective tissue and optimum joint function. Contains 3800 mg. per ounce of Glucosamine (HCL & Sulfate). Also contains Astragalus Herb Powder and Boswellia Extract and more for support. 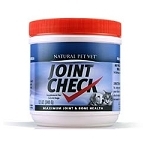 Joint Check is great for any age pet but especially for those that are older or stressed and need a little extra. And just like Health Check, Joint Check will reduce the oxidative stressed caused by the free radicals that are present in the everyday environment. Astragalus Herb Powder, Boswellia Extract, Citrus Bioflavonoids, Licorice Powder, DL-Methionine, Eleuthero Ginseng, Garlic Powder, Ginko Biloba, Grape Seed Meal, Grape Seed Extract, L-Lysine, Manganese Proteinate, Montmorillonite, N-Acetyl-Cysteine, Pine Bark Extract, Yeast Culture. 1 teaspoon per 25 lbs daily (divided amounts if given more than once daily). When starting this product or when needed, amount may be doubled to 2 teaspoons per 25 lbs. Safe use in pregnant animals or animals intended for breeding has not been proven. Not intended for nursing puppies or kittens. WARNING: For animal use only. Keep out of the reach of children and other animals. In case of accidental overdose, contact a health professional immediately. This product should not be given to animals intended for human consumption. If animal’s condition worsens or does not improve, stop product administration and consult your veterinarian. "If you just compare the amount of glucosamine to amounts in other “joint products”, all the extra ingredients are essentially free!" 10 pound size equals 20-month supply for up to a 50 pound dog.